Basic RiderCourse (BRC) — Motorcycle Training Specialists Inc. The Basic RiderCourse is aimed at beginning and returning riders ages 15 and older. The course includes approximately 8 hours of classroom work and 12 hours of riding instruction. This course is held over three consecutive days over a weekend. The course starts on Friday evening at 5:45 and includes 4 hours of classroom. Saturday And Sunday include approximately 4 hours of riding on the range and 4 hours of classroom each day. Insurance Discounts. This course is approved by the Kansas State Insurance Commissioner. The course and the college appear on their web page. Because of this approval, your insurance provider is required to give you some sort of discount for at least 3 years after completing the course. Kansas Division of Vehicles – Certificate of Completion (Form DE-99). This course is approved by the Department of Education as a driver education course for motorcycling. This approval, allows us to issue this certificate to our graduates. The certificate enables the Department of Motor Vehicles to skip the normally required testing. Our student doesn’t even need to take a motorcycle with them when getting their endorsement added at the DMV. People do not learn well without making a few mistakes. Our students get the luxury of making those common mistakes in a controlled environment with professional coaches to help them every step of the way. 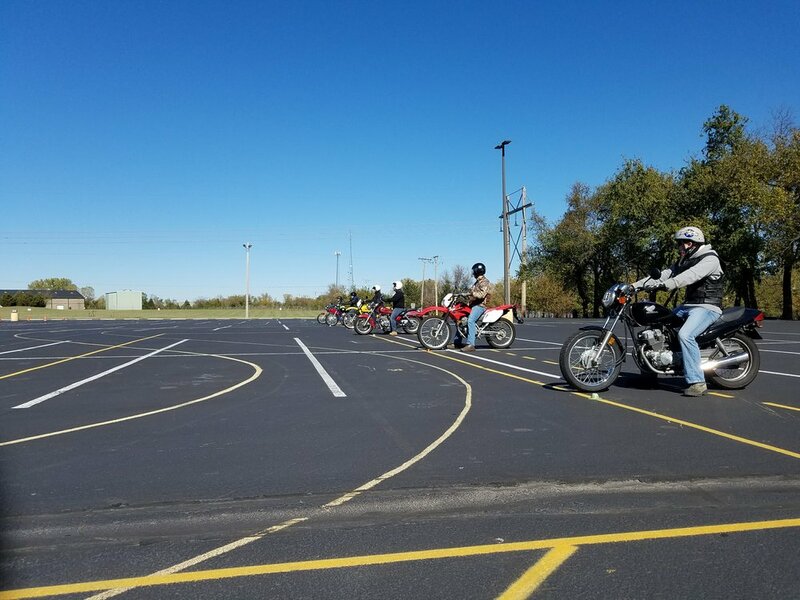 The class teaches the student how to operate a motorcycle safely, with emphasis on the special skills and mental attitude necessary for dealing with traffic. A special segment of the course shows how to create your own strategy for riding in traffic and dealing with critical situations. This course includes both a written test and riding evaluation. Certified RiderCoaches will provide instruction to prepare the student for practical riding in a controlled parking lot. You’ll smile with satisfaction when the RiderCoach hands you the course completion card. Motorcycles and helmets for class use are included in the course fee. Before enrolling in this course participants must be able to balance and ride a bicycle, read, listen and speak English at the sixth grade level. Course is available in Andover, El Dorado, Independence, and Junction City, Kansas. Click the link below or go to our schedule page to schedule a class. Check out our 2019 schedule!